BAT - BLOG : BATMAN TOYS and COLLECTIBLES: New McDonald's Happy Meal Toy DC COMICS / HELLO KITTY DIGITAL WATCHES Spotted in Bulgaria!! 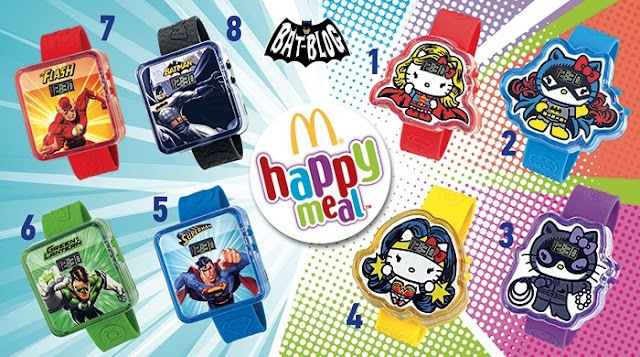 New McDonald's Happy Meal Toy DC COMICS / HELLO KITTY DIGITAL WATCHES Spotted in Bulgaria!! Here's some news for you serious BATMAN memorabilia collectors out there! In the beautiful country of Bulgaria their McDonald's Restaurants are having a promotional tie-in with DC Comics where they have 8 Plastic Digital Watches to collect! Four of them are related to DC Comics Comic Book Characters (Green Lantern, Superman, Batman, and the Flash). I guess these are the ones for Boys. Then, for the Girls, they have 4 other watches that have HELLO KITTY Characters dressed up like superheroes (Catwoman, Batgirl, Supergirl and Wonder Woman). Yeah, you know which three watches I want, ha ha! A friend of our, who lives there, said he already has a couple of these so I guess they're out right now. Yes, sorry, these are NOT available in the USA so you might be able to find them on eBay. OUCH!